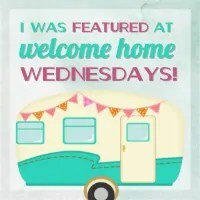 Welcome to Welcome Home Wednesdays #53!!! Who’s excited with the Olympics?? I love to watch in primetime and then catch the recap on the Today show the next morning. It’s so cute how my daughter doesn’t want to miss a minute of it. We keep telling her there are about a gazillion hours of coverage, but she’s convinced she can watch it all! If you’re still getting ready for back to school like us, then you’ll want to pop over and take a look at all the super helpful info in my Ultimate Back to School Guide! Like any good hosts we’re sitting right by the present table waiting until our guests leave so we can go through the loot… the loot being your Welcome Home Wednesdays #53 links! We can’t wait to check out what you’ve left for us. Trust me there will be a lot of pinning, tweeting and facebook sharing going on in the near future… we can’t wait to show off what you’ve left! Erin, Thank you for hosting!! Erin, thank you for hosting each week. Hope the rest of your week is great! Those grilled chicken satay skewers sure look good! Have a fab week! They do look yummy!! I love chicken when it has a lot of flavor! Thanks for coming by! !